2 In the spring of 1941, a group of experienced Chinese antique dealers, including Liang Sicheng, Lin Huiyin, Dunzhen Liu and Chen Mingda came to Sumawan, today in county Gongxian. In the spring of 1941, a group of experienced Chinese antique dealers, including Liang Sicheng, Lin Huiyin, Dunzhen Liu and Chen Mingda came to Sumawan, today in county Gongxian. 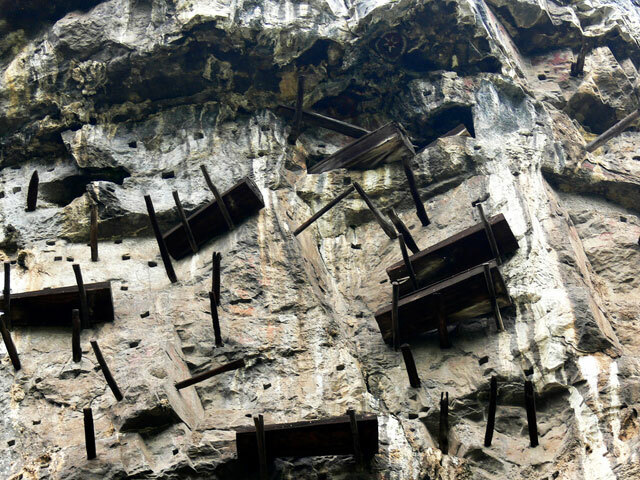 What they found was quite was quite unusual: about 100 wooden coffins were attached to stakes driven into the rock of a 600 meters high cliff. Others were scattered on the ground. Who placed them? Why? How? 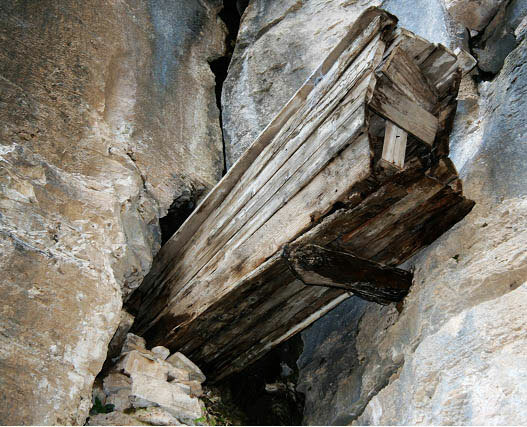 Some historian thinks the coffins had been lowered with ropes from the top of the mountain. Others, however, suggested the hypothesis that those who had placed them, did with the help of the stakes fixed into the rock. Others still think they used stairs. Li Jing, during the Yuan Dynasty (1279-1368), suggested a clue in his “Brief chronicles of Yunnan”: “the coffins are placed so high for hope. The higher and more favorable will be on their way to the underworld . And the coffins that will fall first on the ground, will be those of the lucky ones. ” This tradition is attributed to the ethnic minority of Bo, today disappeared and that a time inhabited the mountainous area along the border between Sichuan and Yunnan. In recent years, ie in September 2002, expeditions were organized to preserve this ancient tradition of which the traces are now lost. In 2003 the works were finally over. 43 coffins were restored and another 16 were found in the area. During this work, new details have emerged about the mysterious culture of Bo. According to Cui Chen, curator of the Museum Yibin, suspended coffins are of three types. Some are located on the wood surfaces. Some are located in the caves while others are simply trapped in the rock. At Gongxian you can find all three types of coffin. The Bo people were an ethnic minority who lived along the border between Yunnan and Sichuan. The first traces date back to about 3000 years ago. Their ancestors helped the Western Zhou (1100-771 BC) to topple the Shan Yin Dynasty (1600 – 1100 BC). The Bo adopted customs quite different from those of their neighbors. Generally they produced their coffins from logs, and preferred not to paint them, or affix other ornamental signs on them. The most recent have been placed 400 years ago, during the Ming Dynasty. The oldest date back to 1,000 years ago during the Song Dynasty. To date, however, the oldest was found in the area of ​​the Three Gorges, and dates back to 2500 years ago, during the period of the Spring and Autumn Period (770-476 BC). 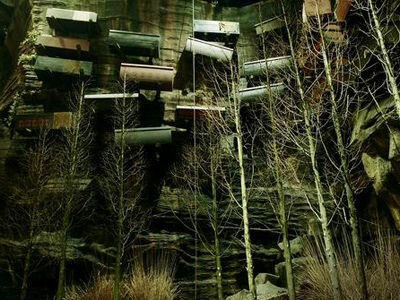 However, the Bo at some point went out quietly from history, and with them also ended the custom of hanging coffins along the mountain slopes in China. During the last days of the Ming Dynasty, the imperial armies oppressed the people of Sichuan and Yunnan. Duzhangman and the Bo were exterminated. To escape their oppressors, the Bo migrated to other areas, merging with other ethnic groups. They hid their names to avoid being captured by the imperial forces and eventually became integrated with the new populations.